When the solar system was born it was a dense cloud of gas and dust swirling in all directions orbiting the new star. As the clouds particles crashed into each other the momentum they carried cancelled out. The direction with the most momentum managed to keep going. Over time this caused the cloud to flatten out into a disk through which the planets formed. 2. Earth is only “marginally” habitable. Some of the Earth-like exoplanets might potentially be far more hospitable to life than Earth is. 3. Astronomers have discovered a planet named HD189733b where it rains glass (silicate) sideways, in howling 7,000km-per-hour winds. This gives the planet a blue hue. It is 63 light-years from us. 4. 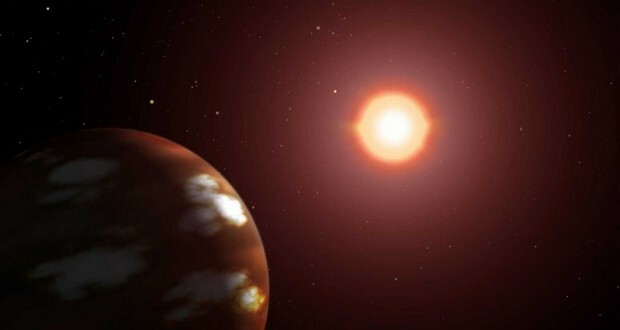 NASA has discovered a "Waterworld" planet named GJ1214b 40 light years away that may contain exotic materials such as "hot ice" and "superfluid water." 5. 51 Pegasi B is a gas giant located 440 light years away from us which has temperatures reaching 1000 to 2000°C. Due to such high temperatures, it rains iron there. Jupiter is shrinking at the rate of about 2 cm each year because the planet radiates more heat than it receives from the Sun. 7. Scientists have estimated that there are nearly 2 billion earth-like planets in the Milky Way alone. 8. There are rogue planets floating through space completely alone, not orbiting any stars. It is also possible that some of these pitch-black planets might support life. 9. Uranus is actually the only planet that rotates sideways and kind of "rolls" around the sun rather than "spinning" like any other planet in our solar system. 10. It rains diamonds on gaseous planets like Neptune and Uranus. They contain methane that at high pressures and temperatures turn into diamonds which then fall to the center of the planet. 12. NASA's Kepler spacecraft has discovered a giant planet the size of Jupiter 750 light years away that is blacker than coal. It is the darkest planet yet discovered by scientists. It reflects less than 1 percent of the sunlight falling on it. 13. Neptune holds the record for the strongest winds in our solar system. Scientists have been puzzled at the discovery of wind speeds reaching 2,100 km/h on Neptune. 14. The asteroid belt between Jupiter and Mars is not the leftover debris of a destroyed planet as it was previously believed. It is, in fact, the remains of a planet that never formed due to Jupiter's mass. 15. The largest scale model of our solar system spans the length of Sweden. The Sun is represented by the largest hemispherical building (Ericsson Globe) in the world in Stockholm. Scientists have found that Jupiter's massive gravity is perturbing mercury’s already eccentric orbit. They have arrived at four possible end results from this finding Mercury will crash into the Sun, Mercury will be ejected from the solar system altogether, Mercury will crash into Venus, or Mercury will crash into Earth in the next 5-7 billion years. 17. Saturn's moon, Titan, is the only body in our solar system beyond Earth that is known to have liquid on its surface. 19. Some scientists believe that around 4 billion years ago Neptune and Uranus may have switched their places in the solar system. 20. Jupiter is the fastest spinning planet in our solar system. Due to the intensity of its rotation the planet is flat at the poles and bulges at the equator. It takes less than 10 hours for it to complete a rotation on its axis. In 2011, scientists discovered a star that they later nicknamed Tatooine (from Star War) that orbits a binary star system (a system of two stars that revolve around each other under their mutual gravitation). 22. On Mars, a dust storm can develop in a matter of hours and can envelop the entire planet within a few days. They are the largest and most violent dust storms in our solar system. 25. 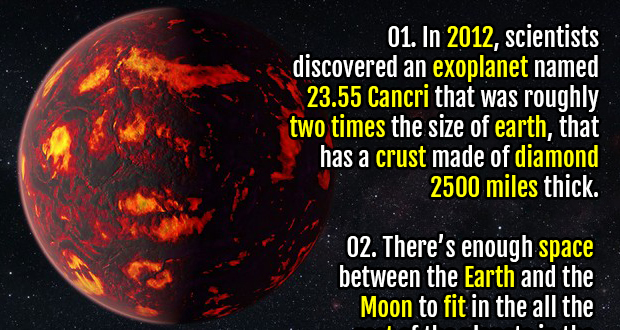 There is an exoplanet called "COROT-7b" where it rains rocks. Its surface temperature is hot enough to vaporize rock pebbles, condense out of the air and rain down.